Josephine Go Jefferies is an ESRC doctoral researcher at the University of Nottingham’s Business School. Her thesis explores patient experience of telehealth for self-management of chronic disease. 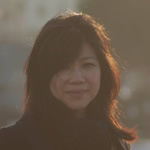 Her research interests are digital health, service innovation and ethical consumption. they do provide mitochondrial biofuel to maintain vast server systems, so you could argue they are, infact, for survival. So far from sea level, we get most of our potable water through our aspiration of the atmosphere aided by hyaluronic acid supplements. We are clean air fanatics up here, and it’s nice to recycle and know that the quality you put in is what you get out in water terms. Your visit is sponsored by our historic brigade of mountain rescue volunteers. Now that we’re all moving to higher ground where it’s cooler and drier, we do what we can – and hope you will too, by letting your data be tracked while you’re up here to advance the science of controlling conflagrations from human or natural causes. I’ve trained as a Mountain Search and Rescue Volunteer, but we’re all standing members of the Fire Service as we anticipate global warming to trigger more drought and forest fires, especially in the lowlands. Our hope is to make wildfire and combustion relics of the past. Only nostalgia buffs and the most privileged innovators can afford to burn oxygen – really, who would want to? We all agree it’s precious. Firefighting is quite an interesting spectacle. Actually, I don’t know if you’ll ever get to witness one unless it’s during a commemorative public fixture. Planned tabula rasa combats conflagration by asphyxiation – literally dialling down the oxygen in the atmosphere. It’s harder to control oxygen in the more populated areas, but they’re working on it. inequality now, do you know what I mean? needed to run anticipatory rather than participatory democracies? Some say they manufacture dissent – for drama, and catharsis – but I think it’s also to flush out the data flow from shadow populations who are more apathetic; making everyone a heavy breather, at least for a little while, you know, just enough to register a reading and get a snapshot of oxygen consumption at a given time. You know what they say: Sport is good. Data rules… right? Anyway, during the spontaneous census they will interview me to see why I’m in favour of this and against that. Just to ensure my opinions haven’t been hacked, you know, to guard against corruption by harmful private interests. Data rules infocracies, and democracies people do! So how it works is, the actions we take are screened for relevance to any given question. We consent to our acts and opinions being counted, and it’s made transparent in the continuous count so we understand the implications of our acts and opinions as a collective. Any inconsistencies are flagged, and we get an option to compare ourselves against thevalues of the electorate. What, actual elections? They’re kind of just ceremonial, really. I guess it’s less dramatic but we’re a more steady community – without all that manipulative rhetoric flying about in what’s left of the news media, making everyone angry and anxious. Life’s tough enough up here without making enemies of your neighbours. The small things seem to matter more these days, which I’m in favour of. gives our team advantages on the happiness meter, earning time-off in lieu. It’s just the idea of time-off, really, but ideas count! I think happiness matters more than bitcredit, care dollars and the million other point schemes you could choose.